The first intelligent sleep mask that can track your brainwaves, eye movements and pulse, featuring advanced, in-built light therapy programs to aid better sleep. Whilst there have been various attempts to bring the humble sleep mask into the 21st century, the Neuroon, from Inteliclinic can claim arguably claim to be the first truly ‘intelligent’ sleep mask to hit the mass market. Originally conceived on Kickstarter as a device for polyphasic sleeping, the Neuroon has evolved to become a more mainstream product to facilitate better sleep and body clock issues such as jet-lag, shift working and ‘smart’ napping. The Neuroon features built-in sensors which detect EEG (brainwaves), EOG (eye movement), body movement and your pulse. Combined with its partner app, the Neuroon offers advanced sleep analytics, including REM sleep staging, a sunrise simulator and a range of light therapy programs. 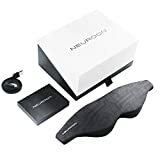 The Neuroon consists of two main components, the mask itself and a ‘smart pack’ – the removable housing which contains all the electronics and sensor hardware. The mask consists of a thin fabric front featuring a dark-patterned geometric design. Glued to this is the body of the mask, a 3/4 inch thick moulded piece of memory foam which is the part that’s in contact with your face. A thin elastic strap attaches to the back. At the top of the mask is a cut-out where the smart-pack is inserted. This compact bundle of electronics is made up of 3 inter-connected mini circuit boards which are attached to the sensors which pick up your physiological measurements. All of the circuitry is housed in a squidgy, silicone material so there are no hard edges to interrupt your sleep. Most prominent are the three brass-coloured sensors which measure EEG (brainwaves) and EOG (eye movement). Whilst buried beneath the silicone you’ll find an accelerometer to detect body movement, a pulse oximeter for measuring your pulse, oxygen blood levels, from which algorithms can determine your heart-rate. At the bottom of the smart-pack you’ll find two LED lights which deliver the light therapy programs via two more small cut-outs in the memory foam. You need to set up the light programs via the smartphone app. The Neuroon app is available for iOS 7 or above and for Android 4.3 and above devices. The advanced sleep analytics provide you with a sleep score each night based on your sleep duration, breakdown of your sleep stages, average heart rate, and instances of waking. As well as the sleep score you can see more detailed readouts of your heart rate, and your sleep stages including REM, light and deep sleep.